Venus aligned with rebellious Uranus brings spontaneity and excitement to love, while the Sun in sensual Scorpio aligned with Scorpio’s ruler, Pluto ignites passion and intense emotions. Whether you are single or coupled, these planetary lineups encourage you to pursue passion in an unusual or unexpected way. Here is your Weekend Horoscope. Psychic Krishni has so much more to share with you! Click here to learn more about her! There needs to be an element of adventure involved in order to arouse your passion. You won’t be content to go on your usual date or stick to the normal routine in the bedroom. If anyone can spice things up, it’s you. Find a way to make romance unforgettable. 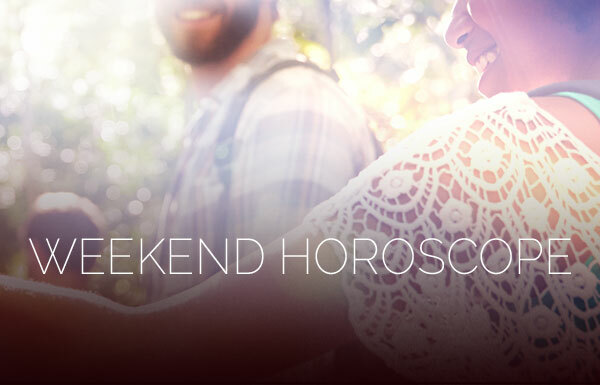 Your Weekend Horoscope shows that you are ready to act out a hidden fantasy. In addition to physical attraction, you will require a meeting of the minds. Intelligence is a major turn-on for you, so be on the lookout for someone who brings both brawn and brains to the bedroom. An exciting double date or group outing could invigorate your relationship. Your connection grows when you and your mate get involved in your community of friends and loved ones. Single Geminis should look to friends to make an unusual love connection. An unexpected introduction could be coming your way. An on-the-job attraction could advance to the next level if you make an unexpected move. If you are prepared to cross a line, then you shouldn’t let coyness get in your way. However, you should be certain that your advances will be well received before you do something crazy. Your Weekend Horoscope shows that the idea of a romantic adventure appeals to you, but the reality is that you might prefer to just hang out at home. Why not prepare a special meal for your mate or favorite date? An enlightening dinner conversation could reveal your mate’s true beliefs. Whether you are single or coupled, you are determined to work on your love life and to transform how you express your desires. A little intimate playtime could definitely help to work out the kinks in your relationship. Single Virgos should spruce up their bedroom and discard decor that kills the mood. An open conversation between you and your love interest could yield some surprising information. Don’t be afraid to question him or her on topics that matter to you. This doesn’t have to get heavy or serious. Keeping the dialogue light and playful inspires you both to open up. You are feeling pretty powerful, so you don’t necessarily need the validation of romance. Your Weekend Horoscope shows that you might be more focused on an unusual project that promises to yield a financial reward. Unless your love interest is involved in what you are currently doing, love right now may not be your priority. You are putting your best face forward in order to meet someone new or appeal to your current love interest. You are pretty attractive when you feel free enough to let people see the real you. Pursuing a crazy activity that you enjoy will put the fun back into romance. Either romance is a totally private affair or you are putting it on the back burner for now. This is a good weekend to spend time with a friend or to get involved with a group activity. Sometimes you feel more empowered when you don’t have to worry about a partner. A friend who has an unconventional way of looking at things could provide interesting insights about your love life. If you are single and looking for love, you might want to take a closer look at a quirky acquaintance. There could be a more exciting connection than you realize. Even though your values and beliefs are a bit unconventional, there is definitely someone out there who will find them appealing. The more you let the world know who you are and what is important to you, the better your chances of connecting with someone who gets you.